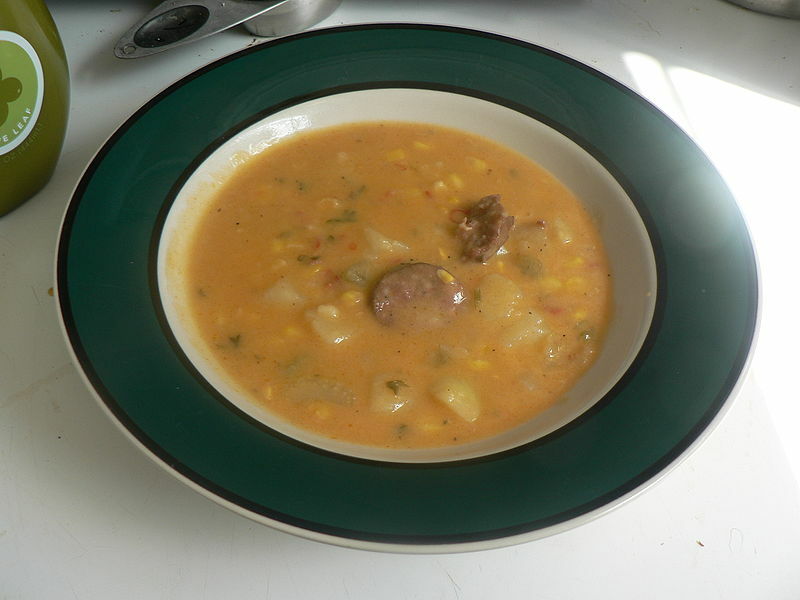 Corn chowder is a type of white chowder similar to New England clam chowder, with corn and bacon substituted for clams in the recipe. Left: A bowl of corn chowder. Creamed corn may be substituted. Add potatoes, celery and boiling water or stock. Add salt or bouillon cube. Cover and simmer over low heat until potatoes are tender. Add corn and evaporated milk (Fresh milk or Cream may be substituted for evaporated milk). Blend together butter and flour evenly and gradually add to chowder. Cook, uncovered over low heat for 20 minutes, stirring occasionally until soup is thickened. Be careful not to scorch bottom (it's best to use a heavy bottomed pan and watch heat carefully). Season to taste with salt and pepper and serve with milk crackers. Add 1 package frozen chopped broccoli for cream of broccoli soup. Add 1 can chopped clams or 1 cup chopped fresh clams for a quick New England clam chowder.